The military manual (Strategikon) attributed to the emperor Maurice stipulated that the infantry contingents should be followed by a train of wagons, some of which were to transport artillery crews, carpenters, and metal workers…In his translation accompanying the Greek text E. Gamilscheg rendered this as “Katapulten nach beiden Seiten zu drehen.” I put it into English as “revolving ballistae at both ends.” I visualized the wagons as mobile fighting platforms with two medium-sized torsion or tension weapons, ballistae, which re- volved in a horizontal arc, somewhat like pivoting machine guns. “Both ends,” though, I am now convinced, refers to the weapon, not the wagon, and the revolving motion must have been vertical, up and down (like a child’s seesaw), not horizontal. Torsion weapons, such as the ballista, do not revolve;the onager, which pivots from down to up, moves only at one end. The Strategikon, I would argue, is not referring to a torsion or tension weapon at all, even though it uses the classical word, ballista, but to a more advanced kind of artillery, recently arrived in the Mediterranean world, which was operated by traction, men pulling ropes at one end of a rotating beam to propel a projectile placed in a sling at the other end, thus “revolving at both ends.” There was as yet no specific term for this artillery piece, but it later came to be known in the west as trebuchet and, as we shall see, very soon in the Byzantine world as helepolis (city-taker). 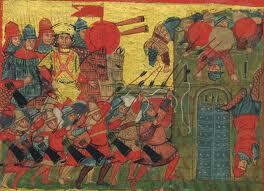 This entry was posted in Articles and tagged artillery, Battle, battles, Byzantine, social history, Strategy. Bookmark the permalink.